Alongside the river Seine, in a spacious workshop with independent work stations, each participant learns to master the art of making French croissants, chocolate rolls and brioches. Who is this workshop aimed at? It is quite simply suitable for all. 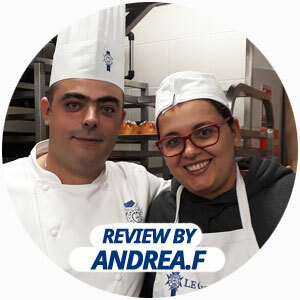 It is for both those who have dreamed of one day being able to prepare an exquisite breakfast for their friends and family without having to go to the local bakery; it is also suitable for beginners, apprentice bakers or those who are passionate about cuisine and want to perfect their technical skills. During the Freshly Baked Pastries Workshop, all the participants listen to the explanations and then make the recipes, under the watchful eye of the bakery Chef. During this workshop, the participants follow the expert advice of the bakery Chef throughout the whole recipe making process. At Le Cordon Bleu Paris institute, we believe that this is the best way to teach the specific know-how required to make the renowned French croissant, chocolate rolls, which are always a firm favourite, and brioches. At the end of the six hours, you will have the opportunity to taste the Chef’s recipes and take your freshly baked pastries home. Savoir-faire, experience and finesse are the qualities that sum up Le Cordon Bleu Bakery Chef Instructors who teach the Freshly Baked Pastries Workshop and Making your own Bread Workshop. Don’t miss out! The origins of this freshly baked pastry date back to 1683, when the Turks besieged the capital of Austria. The croissant was introduced to the French court in the 17th century by the Austrian princess, and Louis XVI’s wife, Marie-Antoinette. However, the traditional croissant, that we know and love today, is made with leavened puff pastry. The combination of leavened dough and puff pastry dough give the croissant its multi-layered structure and light and crispy texture.